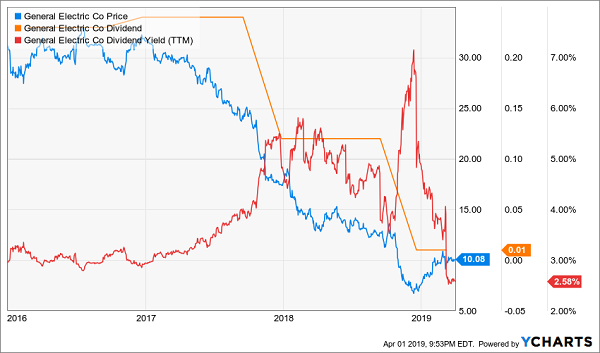 The “not enough cash” problem also prompted me to sound the alarm on L Brands (LB) several times ahead of its 50% dividend cut in late 2018. I get that you don’t want to pore over cash flow statements in your free time, so here’s a quick way to screen for yields that are actually safe. A one-stop shop for individual investors is Blockforce Capital’s proprietary “DIVCON” system. It’s a rating system that takes numerous factors into account in evaluating the health of a dividend: cash flow, earnings, dividend trends and even external ratings. Frontier? DIVCON 1. 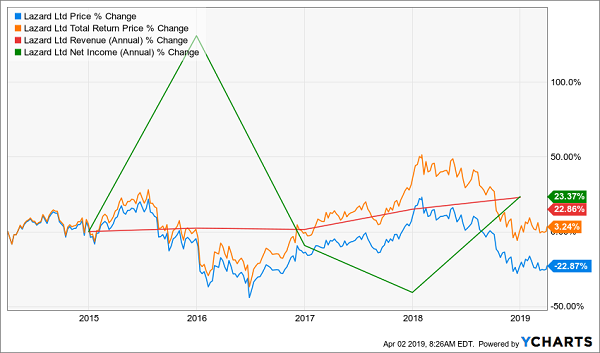 CenturyLink (CTL) – another dividend cut I sniffed out – was a DIVCON 1 stock, too. And General Electric? One of Blockforce Capital’s ETFs, the DIVCON Dividend Defender ETF (DFND), was actually short GE for a time before its dividend cut. Today we tap DIVCON to identify five stocks with solid dividends. Each of these stocks, which yield anywhere from more than 5% to 10.8%, earns a DIVCON 4 or 5 score. Philip Morris markets products like Marlboro, L&M and Parliament, among others, in more than 180 markets. It has moved into tobacco alternatives, including iQOS heat-not-burn systems and Solaris e-vapor products. DIVCON sees Philip Morris’ dividend as plenty safe, and for good reason. The payout has grown for years and the company’s free cash flow has grown along with it. Unfortunately the dividend is safe and sleepy. PM has essentially been dead money over the past five years. PM simply faces an ever-squeezing fist of international pressure against tobacco products. AbbVie (ABBV) might have put together a rocky past couple of years, with its stock leaping from roughly $65 in 2017 to around $125 in 2018 back down to its current perch above $80. But don’t sweat the dividend. AbbVie’s payout has more than doubled from 49 cents per share in 2015 to its current level at $1.07. 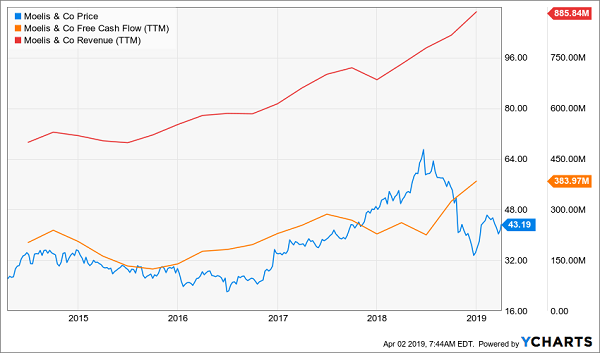 That’s covered by just a little more than half the company’s free cash flow, which has exploded from $7 billion in 2015 to $12.8 billion last year. That’s important, because that means AbbVie can pump money into its R&D to keep its development pipeline flowing. While Wall Street has been fretting Humira’s exposure to the patent cliff, it still has a blockbuster in cancer drug Imbruvica, and has potential annual billion-dollar products in cancer treatment Venclexta and endometriosis treatment Orilissa. That, in turn, should keep the generous dividend well-covered, and give ABBV time to get up off the mat. Lazard (LAZ) is a high yielder that many investors tend to ignore because of its boring business and a name that mostly goes unknown to the consumer class. Lazard is an asset management company – and not a particularly large one at that, at $4.3 billion in market cap – that offers mutual funds, advises on mergers & acquisitions and more. It shares a marketplace with the likes of Goldman Sachs (GS), UBS (UBS) and AllianceBernstein (AB), which is part of why it’s so difficult for it to find the spotlight. Let’s consider that so far in 2019, JPMorgan Chase (JPM) is the top M&A advisory at $182 billion in transaction value across 25 deals. Lazard is 22nd at $10.8 billion across just nine deals. Lazard has been a laggard over the past decade, gaining only about 3% on a total-return basis (without its generous yield, that’s a 23% loss!) That said, the company has produced roughly 23% growth in both revenues and profits during that time, and the stock is underpriced less than 9 times forward estimates. 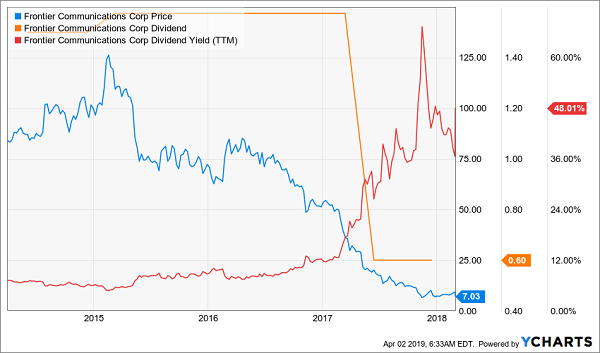 Lazard also is a “sneaky” high-yield dividend stock. LAZ’s headline yield of 4.7% is nothing to sneeze at, nor is its 11-year streak of dividend hikes. But Lazard also pays out a special dividend based on the company’s profits, and has done so for seven straight years. It’s a policy I love because it demonstrates responsible fiscal management, plus it’s a nice kicker to an already attractive yield. When you throw in this year’s 50-cent special dividend, that translates into a substantial 6% yield. Lazard (LAZ): Is The Price Finally Right? Theme park operator Six Flags (SIX) is a comeback story if there ever was one. It filed for bankruptcy in 2009, but it cleared its debt load, brought in new leadership and even started paying a dividend again in 2011. It really put the pedal down on that payout, too, starting from a split-adjusted 3 cents per share back then to its current payout of 82 cents. Since coming back, SIX has ripped off more than 400% returns for investors, though that has come with a precipitous fall in the past year or so. You can blame that on a small bubble burst in its valuation prompted by weak results, especially on the top line. Earlier this year, Six Flags posted a wide beat in earnings (93 cents per share were down year-over-year, but still way better than the 25 cents analysts were looking for), but the top line missed by almost 6%. Analysts are expecting pretty tepid growth ahead, which makes me wary of dipping my toe in at the moment. At the same time, Six Flags did post its ninth record year of revenues, and net income grew year-over-year. The dividend continues to grow. Cash and profits are both still enough to cover that payout, and SIX also has enough cash to keep buying out its stock (about $111 million worth in 2018). So while I’m not encouraging a rush into shares, it is clear to see why DIVCON sees little to worry about concerning the dividend right now. Moelis & Co. (MC) is another high-yielding asset management company a la Lazard. It provides financial analysis, helps raise capital and advises on deals. With a 2.5 billion market cap it’s even smaller and less noticed than Lazard. Looking back at that same list of M&A advisers, Moelis is 26th at $5.8 billion in transaction across 11 deals. But the company is growing like a weed, including 2018 revenues of $886 million (up from $552 million in 2015) and free cash flow of $384 million (up from $139 million). You’re paying a bit more than underpriced LAZ, at under 14 times forward estimate, but you’re getting a company that appears to have more upside potential. 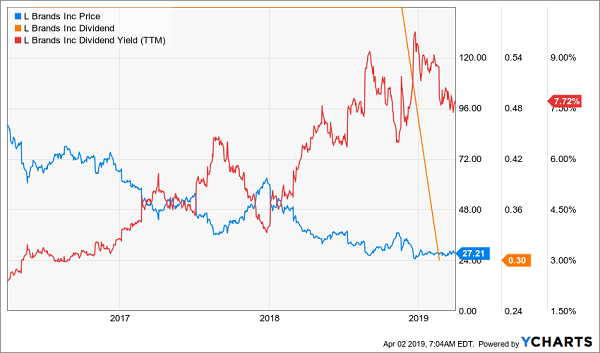 Moelis is also like Lazard in that it pays special dividends – and again, it tends to be more supercharged than its peer. Moelis pays about 4.6% in yield based on its regular dividend of 50 cents per share – itself a massive 150% improvement from 2015 levels. But MC also pays out special dividends, sometimes twice a year. Over the past 12 months, Moelis has paid out two special dividends of $1.25 and $1.50 per share. When you add up all its payouts over the trailing 12 months, the stock has delivered a stunningly high yield of nearly 11%! I love “sneaky” dividend stocks like Lazard and Moelis because they’re wildly undercovered by the analyst community, which means they’re usually underpriced, and that income “kicker” is fantastic for total returns. But they’re not perfect holdings for retirement because you can’t quite count on those special dividends always being there, in the exact amount you need, exactly when you need them. No, if you want to be able to retire on dividends alone, you need the consistent, growing payouts from the stocks I hold in my 8%-yielding “No Withdrawal” retirement portfolio. Decades ago, retirees never really worried about having to sell their nest egg for scrap in retirement because… well, people didn’t last very long past retirement. That’s not the case anymore. Science says you and I are likely living another 10 to 20 years once we clear out our desks, which means the bulk of our retirement income has to come from income, not siphoning off our accounts and praying they last. An average 8% portfolio yield: Let’s say you save up a million dollars for retirement and park it in a 60/40 account. That’s likely only throw off 3%, maybe 4% if you’re lucky, in pure income – which only comes out to $30,000-$40,000 per year. And that’s if you’ve saved up a million! But if you’re starting out at an average 8% yield, that, as well as your Social Security checks, combine for a retirement you can be comfortable with without every touching your nest egg. 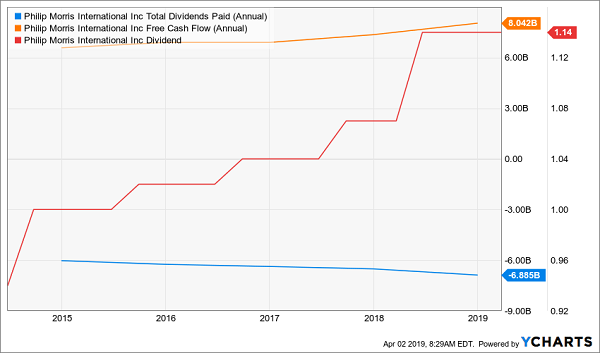 Robust dividend growth: Here’s something many investors never think about: If you hold a dividend stock and its payout stays level from one year to the next, you’re actually losing income every year! Thank the dark magic of inflation for that. That’s why it’s vital that your portfolio not just offer a big headline yield – it also needs dividend growers to make sure you still have the same purchasing power in 2020, 2025 and 2030! The potential for 7% to 15% in annual capital gains: If you’re going to live off dividends forever, why do you need to grow your nest egg at all? Because like Nationwide says: “Life comes at you fast.” Whether it’s major surgery, a natural disaster or a son/daughter in need, sometimes you might need to pony up a decent chunk of change. 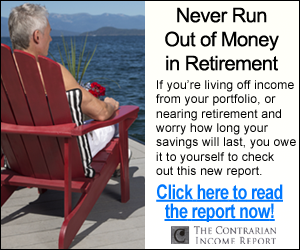 Thus, continuing to grow your nest egg in retirement allows you to absorb that kind of hit without sacrificing your ability to generate income. The “No Withdrawal” portfolio is an all-star cast of stocks that deliver on all three points: an 8% average yield, dividend growth and significant price appreciation potential. So you can sit back and collect dividend checks but also be covered should disaster strike, forcing you to dip into your retirement account. This diversified set of picks features the “Alphabet Soup” of dividends: REITs, BDCs and CEFs, which are all fantastic high-income assets that often go overlooked by Wall Street analysts and pundits alike. This portfolio will let you live off dividend income alone without ever touching your nest egg. The mortgage? Check. Power? Check. Phone? Check. But best of all, you’ll generate so much income that you’ll be able to cover far more than just the necessities. Kitchen renovation? Check. Roadster? Check. Vacation home? Check. And you’ll be able to afford all this without wondering how you’ll cope should disaster strike. Let me show you the way to the comfortable, secure retirement you’ve worked your tail off to enjoy. 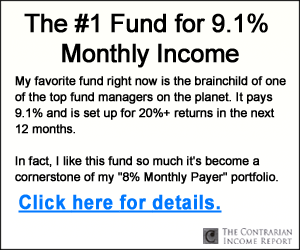 Click here for all the details, including THREE special reports that reveal exactly how to build this “No Withdrawal” portfolio. You’ll get the names, tickers, buy prices and full analysis of their wealth-building potential – and it’s absolutely FREE!